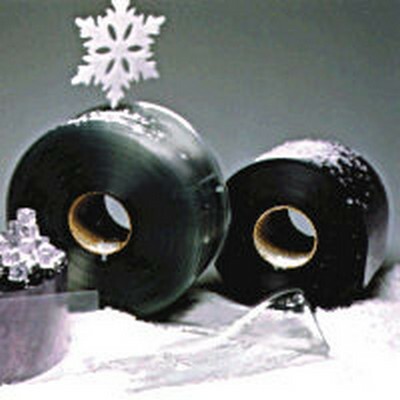 4" x .060 x 150' Half Roll Low Temp | U.S. Plastic Corp.
PVC Strips for strip doors are available in a variety of widths and thickness to meet your application requirements. Personnel doors and walk-through doors generally require a lighter material; such as, 6" strips for ease of passage. 8" material is ideal for strip doors inside a warehouse for lighter traffic. Most common industrial material is 12", ideal for doorways up to 15' high. 16" material recommended for any doorway over 15' high. Ideal for cooler and freezer door applications, this material meets all USDA and FDA regulations for incidental contact with packaged meat, poultry and dairy products. The low temperature additive allows the strips to remain flexible at temperatures as low as -30°F. For severely low temperature requirements, we also have a reinforced material, which remains flexible at -75°F. Ribbed material is great for high traffic areas.